Frito-Lay is running a back-to-school promotion for its Variety Packs that combines an on-pack engagement device, a sweeps, and a new Alexa skill. 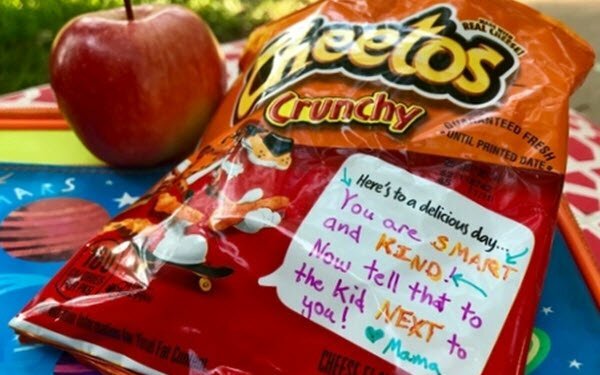 The “Snackable Notes” promotion, which runs through Sept. 9, centers on specially marked Variety Pack packages featuring a “talk bubble” — an empty space where parents are being encouraged to write notes of love and encouragement their kids will see when they pull their Cheetos, Lay’s, Doritos or Fritos snack bags out at lunch. The concept of using a common school lunch item to write and send notes to kids isn’t new. For example, it’s already being employed in a new campaign from Dole Fruit Bowls. But Frito-Lay is also encouraging parents (and teens 13 and older) to visit the promotion’s site, provide their birth dates, emails and other information to register, and post a photo of their bag-with-note to qualify for entry into a sweepstakes offering a $1,000 weekly prize for nine weeks (plus “extra credit” cash prizes). Starting later this month, parents can say, "Alexa, open Snackable Notes," or search for Snackable Notes in the Alexa app or Alexa Skills store to hear their choice of funny, encouraging or thoughtful note ideas. Presumably, Frito-Lay is hoping to transition Alexa users over time to voice-ordering its snacks via Amazon — one of many efforts to grow the brands’ online sales channel. According to some researchers, only about 40% of voice-activated device owners use them for online ordering.